Instant Pot Chili Recipe – This beefy chili is easy to make and super flavorful. 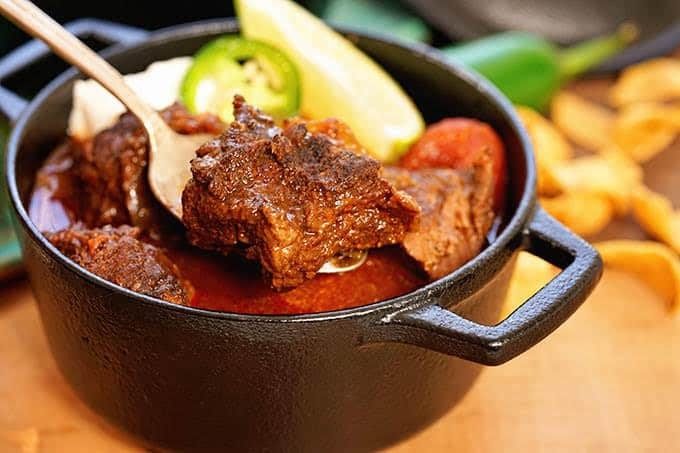 Full of warm chili spices and excellent flavor! Chili con Carne is easy to make in your pressure cooker! Follow my tips easy steps to make this delicious recipe, and grab my Instant Pot cheat sheet. 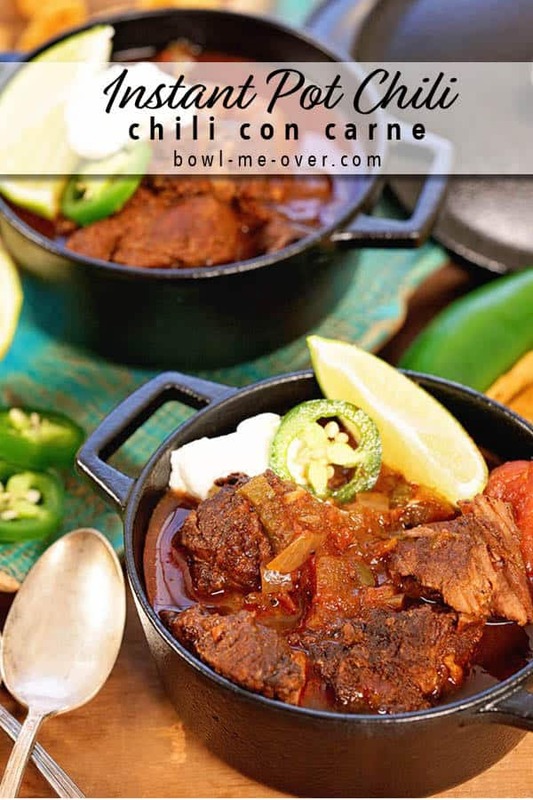 To make this recipe, you will need: chuck roast, onion, jalapeños, beef broth, canned tomatoes, crushed tomatoes, beer, spice mix, chili powder, dry mustard, cumin, smoked paprika, cocoa powder, cornmeal, and salt. I’m getting together with colleagues for a retreat this week. In Chicago. In January! What the heck we were thinking?!!! The high is supposed to be 13 degrees. Now I used to live in Green Bay and Minneapolis, but let’s get real…. I’ve been in California for 15 years and I’ve gotten used to the warm weather and sunshine! Yup… pretty sure I’m going to freeze! Boy is this chili going to taste warm, filling and delicious! Hey if you haven’t stopped by Bowl-Me-Over yet, then you don’t know how much I like chili! Tailgate Chili, White Bean Turkey Chili, or Butternut Squash Chili. It’s safe to say I haven’t met a chili that I don’t like! What makes this chili even better that it’s Instant Pot Chili made right in your pressure cooker. Love that! This is Chili con Carne – meaning chili with meat. No beans, but beef braised in warm chili spices, tomatoes and beer. This is one delicious meal! If you’re new to the pressure cooker get a free cheatsheet by clicking the photo above! What gives chili con carne its flavor? The flavor comes from all the chilis. 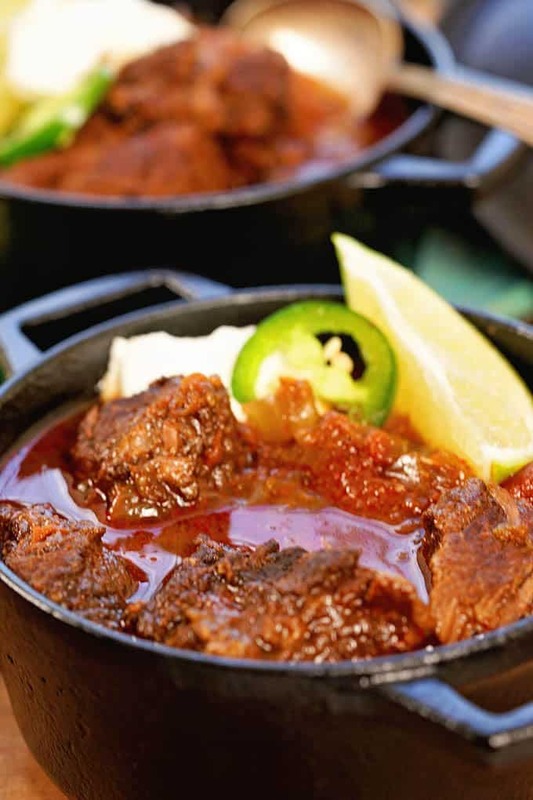 Though it may seem like there’s a lot of hot spice, the spices in this chili are warm, not hot! It’s perfect for cool days and cold nights! Cumin gives it a rich earthy flavor and the smoked paprika makes it tastes like it’s simmered all day long! The cocoa powder balances everything out and makes for a perfect combination of flavors! Remove excess fat from the meat, then cube the roast, put in a ziplock bag, add a tablespoon of oil. Add the spice mix, massaging it into the beef. Dice the onion, mince the jalapeños and garlic. Set the pressure cooker on sauté, add oil and sauté the beef browning on all sides. Remove when browned and set aside. Next sauté the diced onions and jalapeños until soft. Add the garlic and sauté another minute. Turn the pressure cooker off. Pour in the beer and with a wooden spoon, scrape the brown bits off the bottom. Seal the pressure cooker, set timer to 30 minutes and valve to seal. The blog is filled with lots of great soups and stews. Here are a few of my favorites! Please stop by the blog! You’ll find the recipes on the blog aren’t too complicated but are full of big flavor! I hope I see you soon! 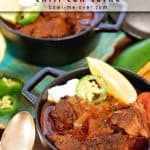 Instant Pot Chili Recipe - This beefy chili is easy to make and super flavorful. Full of warm chili spices and excellent flavor! 2 tsp salt more to taste at the end of cooking. Serve with optional toppings, corn chips, sliced jalapenos, sour cream, lime wedges, sliced radishes, shredded cheese.